When it comes to ‘superfoods’, tomatoes are among the most accessible. They are easy to find in the shops and not prohibitively expensive like other superfoods such as pomegranates, blueberries or goji berries. They are even easy to grow – if you’ve got the space. So why are tomatoes so special? What Nutrients Are in Tomatoes? Tomatoes are a very good source of Vitamin A, Vitamin C, Vitamin K, Potassium and Manganese, and a good source of Vitamin E, Thiamin, Niacin, Vitamin B6, Folate, Magnesium, Phosphorus and Copper. As well as this, tomatoes are currently the best known natural source of the phytonutrient lycopene. Lycopene is a natural pigment that gives the tomato its red colour. It is also one of our most powerful antioxidants. Antioxidants have a protective effect on our cells and are often described as being ‘anti-aging’. Lycopene in particular has been noted for its ability to protect DNA and prevent disease, and it continues to be the subject of studies on heart disease and cancer. In response to positive results from these studies, supplementation companies have released a number of lycopene supplements on to the market. However, many of these studies also support tomatoes in preference to supplements. It appears that the combination of nutrients in tomatoes is the key to lycopene’s health-promoting properties. Tomato Purée vs Tomatoes – Which is Nutritionally the Best? Unlike most fruits and vegetables, where nutritional content decreases with cooking, processing tomatoes increases the concentration of bioavailable lycopene. Lycopene in tomato purée is four times more bioavailable than in fresh tomatoes. Other products, which contain higher concentrations of lycopene than raw tomatoes include pasteurised tomato juice, tomato soup and tomato sauce. Because of its greater concentration of lycopene, tomato purée – also known by its Italian name passata di pomodoro – is often used in scientific tests. It consists of tomatoes that have been cooked briefly and strained to give a thick liquid. The ingredients of tomato purée should be 100 per cent tomatoes and nothing else – and if you can find an organic purée all the better. tomato ketchup at meal times. Choose processed tomatoes (purée, paste, soup or sauces) or crush and cook them yourself. Check the labels on any tomato products you buy and opt for those displaying only natural ingredients. Serve tomatoes with olive oil. As lycopene is fat-soluble, this increases absorption during digestion. In a study published in the January 2009 issue of the Journal of Bone and Mineral Research, a higher intake of lycopene was found to be associated with a lower risk of hip fracture, suggesting a protective role in bone health. Lycopene is thought to neutralise the harmful effects of UV light. In 2008, the British Society for Investigative Dermatology presented research on the use of tomato lycopene as a sun-protection aid. In their study, a group of people who received 55 grams (five tablespoons) of tomato paste with 10g of olive oil a day for 12 weeks showed 33 per cent more protection against sunburn. As good as this sounds, tomato eaters should not consider giving up their sun cream as this increase in protection is equivalent to a sun protection factor of only 1.3. However, the longer your diet includes good quantities of lycopene, the greater the effect. Increasing levels of lycopene in your diet could also have a positive effect on the skin aging process, keeping you looking younger for longer – and who wouldn’t want that! The British Society for Investigative Dermatology found lycopene to boost levels of pro-collagen – which gives skin its structure and elasticity – and reduce damage to mitochondrial DNA in the skin. Research suggests that men who suffer from infertility often have low lycopene levels. Lycopene is believed to help in the production of agile sperm by fighting off free radicals, which can damage their cells and DNA. As well as lycopene, tomatoes contain good levels of vitamin C, potassium and folic acid, all of which are needed for male fertility. In a study conducted by Portsmouth University, healthy men who ate 400g of tomato soup every day for two weeks increased their lycopene levels by between 7 and 12%. Regular consumption of tomatoes is also thought to boost prostate health – important for sperm production – and lower the risk of prostate cancer. Tomatoes were found to soothe inflammation in the airways of asthma sufferers in a trial at Australia’s Hunter Medical Research Institute. Scientists saw improvements in lung health after test subjects consumed a lycopene-rich diet with three glasses of tomato juice (the equivalent of 1.5kg of fresh tomatoes) a day over a period of time. The beetroot will definitely get juiced, the parsnips will be made into one of the recipes in my 10 Tasty Parsnip Recipes post and I quite fancy the Honey Creamed Turnips here. This week’s ‘first’ is the pak choi – also known as bok choy and Chinese cabbage. According to Wikipedia, pak choi is related to the cabbage and belongs to the same vegetable species as the turnip – which I would never have guessed. All of pak choi is edible, I just cut off and discard the very bottom of the stems. The leaves can be eaten raw in salad or are quick to wilt by steaming, sauteing or stir frying. The stalks hold their water well, which makes them refreshing to eat. They take a little longer than the leaves to cook, so put them in the pan first. Today I had half of my pak choi in a stir fry with tofu and any other random thing I could find, including a courgette, half a chilli and some brazil nuts. What Nutrients Are in Pak Choi? Pak choi is a very good source of vitamin A, vitamin C, vitamin K, riboflavin (B2), vitamin B6, folic acid, calcium, iron, magnesium, potassium and manganese, and a good source of fibre, protein, thiamin (B1), niacin (B3) and phosphorus. The label on the bag of potatoes tells me that these are locally grown white potatoes called ‘Madeleine’. While I was searching for information on this variety (couldn’t find anything), I discovered a handy chart on the Potato Council website for matching potato varieties to a range of cooking methods. Click here to find the best varieties for boiling, mashing and roasting, and for salads, jacket potatoes, chips, potato wedges and dauphinoise. What Nutrients are in Potatoes? The Potato Council nutrition page shows that potatoes are a good source of: • Vitamin C • Vitamin B1 • Vitamin B6 • Folic acid • Iron and • Potassium. What’s more, they have higher levels of these nutrients than both rice and pasta, and contain less calories if you are eating them boiled. From the Potato Council website I also discover that 2008 is the International Year of the Potato. Click here for the official IYP website where you are sure to find everything you wanted to know about potatoes but were afraid to ask! There’s still time to catch a few of the scheduled IYP events, including the Potato Exhibition in Rome (6 Dec–9 Jan 09), the Potato Festival in Russia (10–11 Dec) and the World Potato Congress in New Zealand (22–25 march 09). So, What’s This Kohl Rabi Then? Introducing the Sputnik Cabbage Turnip . 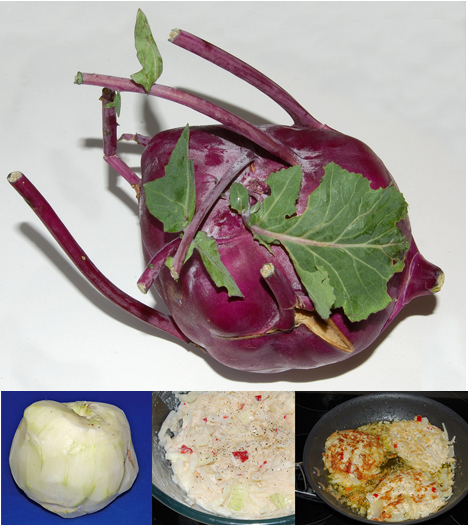 . .
Kohl Rabi seems to be most commonly described as a spherical, Sputnik-like relative of the cabbage. Translate its name and the German ‘kohl’ becomes cabbage, while the ‘rabi’ is linked to the word Rübe, which is Swiss-German for turnip (a reference to its shape, not its taste). Often misclassified as a root vegetable, it grows just above the soil line, and comes in white (light green) and purple varieties. It is a member of the brassica family of vegetables, which includes: broccoli, brussel sprouts, cabbage, cauliflower, kale, mustard and sweeeeeeeeede. Nutritionally, kohl rabi is a very good source of fibre, Vitamin C, Vitamin B6, Potassium, Copper and Manganese, and a good source of Vitamin B1 (thiamin), Vitamin B9 (folate), Magnesium and Phosphorus. What Does Kohl Rabi Taste Like? Well, I read that you can eat it raw and that the small green varieties have a sweetness similar to an apple, but my kohl rabi is BIG and purple. With a potato peeler I took off the skin, which was thinner than I had imagined. I was met with a smell similar to that of cabbage stalk. Eaten raw it was certainly crunchy like an apple, but it tasted like, well . . . cabbage stalk. I searched for recipes on the Green Earth Institute and Simply Recipes websites, and chose to try Kohl Rabi Hash Browns, which were alright (but nothing to blog home about). Kohl Rabi Ham Bake – a gorgeous sounding mix with ham, cream and nutmeg. My final verdict on kohl rabi? It’s alright! Next time I’ll try it a different way. The recipe for Kohl Rabi Indian Style sounded pretty good. Last night I ate half the punnet of mushrooms in a quinoa mix. I put the quinoa on to simmer then diced the mushrooms and fried them in butter with garlic. When the quinoa was done I mixed in the mushrooms then added a chopped chilli and cubes of avocado. In my usual style, it was created from what I had around at the time and what I thought might go together. And it was very, very tasty. As nice as standard cup mushrooms are, they don’t really taste of much on their own, so it’s hard to believe that they can be much good for us nutritionally. I decided to find out what the humble standard mushroom really has to offer . . . So What Nutrients Do Mushroom Contain? Not only are mushrooms low in calories and fat-free, they are also an important source of B vitamins for those of us who don’t eat meat and according to The Mushroom Council they are ‘the only natural fresh vegetable or fruit with vitamin D’. It’s not all good news though. If you suffer from fungal or yeast infections you should avoid mushrooms as fungus and yeasty foods can exacerbate the problem. • VITAMIN B2 (riboflavin) – helps in the maintenance of healthy red blood cells, fat metabolism and nerve transport. • VITAMIN B3 (niacin) – promotes healthy skin and helps with fat metabolism and nerve transport. • VITAMIN B5 (pantothenic acid) – important in the production of hormones, fat metabolism and maintenance of the nervous system. • VITAMIN D – its major function is to absorb calcium and phosphorus to maintain bones. • SELENIUM – an antioxidant that helps to protect our cells from damage, also important for immunity, fertility in men and the production of thyroid hormones. • COPPER – helps to make red blood cells and collagen, carries oxygen and keeps bones and nerves healthy. • POTASSIUM – maintains fluid and mineral balance, and helps to control blood pressure. Also involved in muscle contraction and nerve transmission. • ERGOTHIONEINE – an antioxidant, important for immunity and the protection of cells. It seems that the humble mushroom does have a lot to offer, especially when it comes to vitamin D, and the more antioxidants you can get in your diet the better. So grab a handful and chuck them on your plate, cooked or raw! ‘Eat a rainbow’ is a phrase that is becoming more and more used these days, but other than the obvious visual differences, what does this actually mean? Much like different pigments make up different colours in art, different nutrients and phytochemicals, give fruits and veg different colours in nature. To get the benefits of the nutrients available you need to eat a selection of fruits and veg from across the colours of the rainbow. Just think ‘colour’ when you’re shopping in the produce aisle and see how your basket looks. Now, we’ve all heard of nutrients such as vitamins and minerals, but what are these things called phytochemicals? Phytochemicals are biologically active compounds that are found in natural foods such as fruit and veg. Although these are not technically classed as nutrients, phytochemicals can have a wonderfully restorative effect on the body, for example, they can boost the immune system to help us keep on top form, and they can help to balance our hormones. One of the most important aspects of phytochemicals is their antioxidant properties. Antioxidants help to soak up the negative effects of free radicals and oxidants such as smoke and pollution – the things that can cause our cells to age and encourage disease. 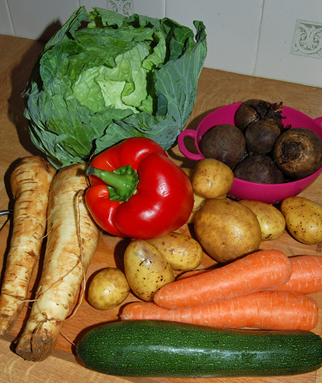 With a veg box scheme, not only are you eating vegetables regularly, but you are also getting a range of nutrients and phytochemicals thanks to the different varieties that turn up in your box each week. Not only that, because the veg is organic and fresh from the farm you are getting the best from it. It hasn’t absorbed chemicals, it hasn’t been packaged in plastic and it hasn’t been sitting around in transport vans for days. To get the best from veg you need to eat it as fresh as possible because as soon as it is picked it starts to lose its nutrients.